Novobiocin Sodium Salt is an aminocoumarin antibiotic targeting gram-positive bacteria. It is used as a tool to produce positively-supercoiled plasmid DNA and in heat shock protein studies as it is an inhibitor of Hsp90. Novobiocin functions as an competitive inhibitor of prokaryotic DNA gyrase and eukaryotic DNA topoisomerase II. 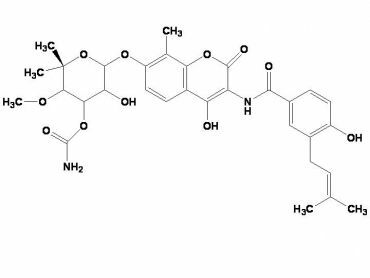 By inhibition of these enzymes, novobiocin blocks DNA synthesis, ultimately causing cell death. Antibiotics are often used in clinical in vitro tests known as antimicrobial susceptibility tests or ASTs to determine their efficacy against certain bacterial species. They are tested against gram-negative and gram-positive bacteria using panels, discs, and MIC strips by medical microbiologists. ASTs decrease the risk of using an antibiotic against bacteria exhibiting resistance to it, and the results are used in clinical settings to determine which antibiotic(s) to prescribe for various infections. Storage/Handling: Store desiccated at -20 °C.